What is the side dish that comes to mind when you think of summer barbeques and picnics? I think for most Americans it is potato salad. I LOVE potato salad! I swear I could eat it as a side to almost any meal. I have my favorite recipe I’ve tweaked over the years and have finally come up with what I think it the absolute best potato salad. I have not found someone who doesn’t love this and I am asked for the recipe often. My husband isn’t a huge potato salad fan but he LOVES this recipe and always asks me to make it. This is your classic mustard, egg, and pickle potato salad but I think it is so tasty because of my favorite secret ingredient. Bacon. Bacon makes everything better doesn’t it? 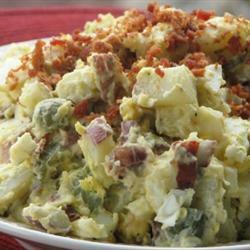 The crunchiness of the bacon takes the textures in this potato salad to a whole new level. Not to mention how much it adds to the overall flavor. It is a party in your mouth. Before I give the recipe, I would like the give some tips on how to prepare potato salad safely. It often gets a bad rap for giving food poisoning at picnics, which can definitely happen. If you go to a barbeque or picnic and see a delicious bowl of creamy potato salad sitting there, you do have to wonder a couple things. How long has it been sitting out in the sun? Was it even properly chilled while being prepared? I had a friend growing up whose parents completely forbid the family from eating potato salad to avoid food poisoning. Here are a couple steps to take to ensure that your potato salad is properly chilled when preparing it. After you boil your potatoes, lay them out on a cookie sheet and place them on the counter to cool to room temperature. When they have cooled, move them to the fridge. Once they have fully chilled go ahead and finish preparing your potato salad. Follow these same steps for the hard boiled eggs. As soon as they have finished cooking, remove the shells, dice them up and put them on a tray to cool down to room temperature. Then move them to the fridge to chill the rest of the way. Most of the time when people make potato salad, you just throw those boiling hot potatoes and hot hard boiled eggs in the bowl you are going to be serving from, you throw everything else in there and toss it in the fridge for an hour before your party to cool it down, but the potatoes in the middle never got chilled all the way through. If you were to bring this and lay it on the table in the sun, you are just asking for food poisoning! It is a misconception that the mayonnaise is one of the main culprits for contaminating the potato salad. This is actually not true. In reality, mayonnaise actually acts as a preservative, which protects the potato salad from bacteria. This is because commercially purchased mayonnaise is made with pasteurized eggs (heated to 140°F) and has a high acid content that actually slows bacteria growth. In actuality, the real offenders behind many bad batches of potato salad are the eggs and potatoes. Both of these are loaded with proteins and carbohydrates – everything bacteria needs to thrive. These are also the two ingredients that are prepared hot first, then cooled and added to the other ingredients. After your potatoes and eggs have cooled in the fridge, go ahead and assemble your potato salad and keep it in the fridge right until you are headed out the door. Then put it in a cooler on ice and when you arrive at your destination you should have 2 hours for it to be safe until you need to throw it out. Only one hour if the ambient temperature is above 90 degrees. So eat fast! In an outdoor setting it is also helpful to cover your food whenever possible. This will help keep it cooler for longer. Now onto the recipe! I hope you enjoy! Bring a large pot of salted water to a boil. Chop up potatoes into cubes and cook until tender but still firm, about 15 minutes. Drain and spread on cookie sheet to cool to room temperature, then in the refrigerator to cool. Place eggs in a saucepan and cover with cold water. Bring water to a boil and immediately remove from heat. Cover and let eggs stand in hot water for 10 to 12 minutes. Remove from hot water, cool, peel and chop. Place on tray and cool to room temperature, then move to refrigerator to cool the rest of the way. Add potatoes to a large bowl, leaving the skin on, along with the eggs, pickles, and onions (if using.) Add mayonnaise, mustard, salt and pepper to taste. Chill for an hour before serving and add the bacon right before serving so it stays crunchy.